You may have finished setting up furniture at your new house or feel that your existing living space looks unfinished and dull, it's more likely due to lack of accessories. It's time to revamp your space and add accessories that reflect your personality. Whether your décor set up is a minimalist or grandeur, giving a stylish or a refreshing look by adding accessories distinguishes your home from a furniture showroom. To get a cosier and welcoming look, mixing elements in your décor is a must. Carpets: The first thing you notice or perhaps your feet, when you sit on a sofa is a carpet or rug. Whether traditional or contemporary, hand tufted or hand knotted, shaggy or Frieze, it all depends on your overall set up and personality. Besides, carpets enhance the size of your room, visually appealing to the eyes. Neutral colours such as beige, black, brown, grey or white go well with most of the décor setting. These colour carpets have a flexible and a utilitarian value when it comes to protecting it from dust and dirt except white. To present an artistic and classy appeal to your décor, place a contemporary carpet with bright colours. For lounge area, a plain rug with various weaves and textures and modern designs looks great. Carpets have been used to accessorise homes for thousands of years. They are placed as a centrepiece of your room, and should fit your space and your furniture comfortably. They offer a layer of warmth and comfort that is unmatched by any other accessory. Eventually, the carpet you choose will become the foundation of your fashion decor for each room you design. To name a few of our carpets - Hands Carpets, Calligaris Stars, Marocoo. Check out our carpet collection here. Coffee Table: Centre table or coffee table is a place where you spend plenty of time with your family and friends together watching TV, playing cards or board games, having coffee/tea or after-dinner conversations. With its many functionality, it is hard to imagine a living space without one. Available in various finishes, choose glass for contemporary look and choose wood for classic or traditional look. It makes room for more accessories like centrepieces and crystal ware or space to stack coffee table books. In all these tables make your living space complete infusing your space with modern flair. To name a few of our coffee tables - Alf Canova, Alf Capri, Alf Opera, Alf Teodora, Alf Monaco, Alf Italia, Calligaris Element, Calligaris Island, Calligaris Tweet, Calligaris Shell, Tonin Casa Splash, Tonin Casa Missouri, Tonin Casa Kos, Bonaldo Doppler, Pebble, Arvo, Bend. Explore our entire coffee table collection here. Centrepiece: Apart from ash tray and vases that are usually found lying on your coffee tables, consider a centrepiece this time. Ranging from style and designs, use these centrepiece filled with fresh flowers, beads, pebbles or marbles to give a feeling of plush. Our centrepiece collection includes: Mario Cioni Purpose, Mario Cioni Jester, Mario Cioni Luxe, Calligaris Lift, Calligaris Glenn, Calligaris Lennox, Calligaris Krok, Calligaris Kalika. Mirrors: Keeping mirrors only in your bedroom and bathroom is an outdated trend when it comes to adorning your space and latest trends. Add them to your living space and make your space look classy. Keeping abreast with trends is must these days because today you’ll find different shapes and sizes of mirrors. Placing them in your space creates a great focal point which means your guests won’t be able to take their eyes off them. Mirrors are great to help create the illusion of space and light as well as make your furnishings stand out. Placing mirrors cleverly can instantly give you the desired look you want for your space. Place your mirror across from a window and you’ll learn that the light will bounce off the mirror into the room portraying more natural light into your home, making it appear more spacious. Place small mirrors in dark or small corners so that light draws in to the area and brightens it up. To name a few mirrors - Calligaris Damasco, Bubbles, Lune, Moss, Drop, Double, Bonaldo Orazio, Hang up, Azero, Tonin Casa Agrip, Olni, Dalton, Granada Mirror, Skin, Stone, Kolonaky, Costantia. Check out our entire collection here. Vases: You may have been gifted a vase for your birthday, wedding or anniversary, use it to complement your decor. Having a longest history dating back to 5000 B.C., vases were used for a lot of purposes before they took their centre stage in home design. Whether you want to use them by filling florals, or whether you want to leave them on a shelf or corner as a showcase, it is up to you. Valued for their beauty and decorative aspects, use these trendy and modern design vases to turn your home into an art gallery. To name a few vases - Calligaris Blanco, Evan, Tristan, Dream, Bluma, Lennox, Holly. Mario Cioni Meta-Morphosis, Mirus Medium. Check out our entire collection here. Lamps: They are generally used to create a mood and set the ambience in your decor. Whether it is a floor lamp, wall lights or table lamp, each one has a different role to play and increase the elegance of your space. Because the living room serves so many purposes, lighting becomes extra important. You can use a blend of accent, task and decorative lighting in your living space to highlight your furniture or any antique piece. Use lamps close to a mirror as it will bounce into dark corners and brighten dead ends enhancing your space. Make sure the colour of your lamp complements your decor. Its main function is not only to illuminate a room but to make your space look warm and welcoming so that your friends and guests can linger longer. Each room in your home should have a mood you want to set, as well as a function you want your lighting to serve whether it is for ambience, aesthetics, or to achieve a variety of functions and activities in that space. Use a tall lamp on a low table; and a shorter lamp on a higher table. Today, lamps are made to fit any mood or special needs, and they come in several sizes and shapes. Types of lamps include floor lamps, wall lamps, theme lamps and high intensity lamps with a direct beam. One main facet to remember is not to use lamps as general lighting but only to complement the mood and ambience of your space. 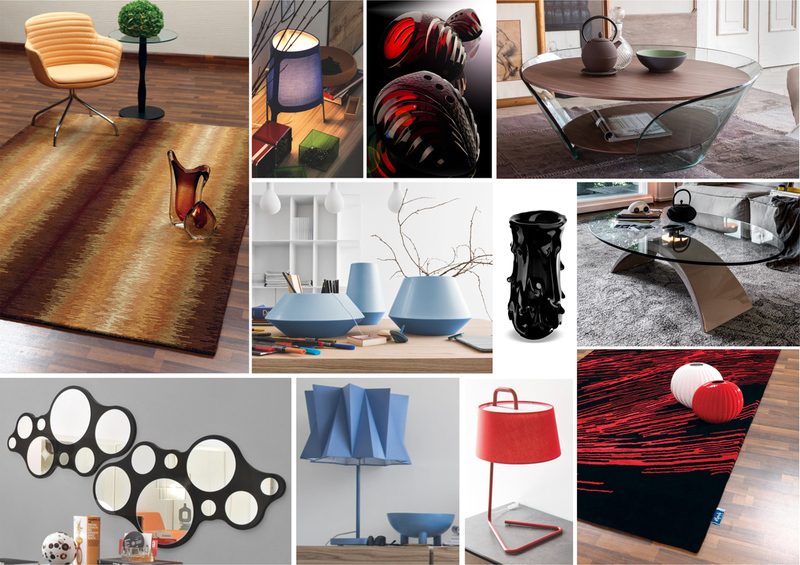 To name a few of our lamps - Calligaris Phoenix, Sextans, Andromeda, Pom-Pom, Allure, Bonaldo Muffin, XXLight, Eos, Tonin Casa Spiga. Read more. Crystalware: If you're having guests or friends around at home and are planning to drink straight out of the bottle, make it special with some classy glassware. As much as you plan to have wine, whisky or gin, use them for a fun way to mark guests' glasses. Besides you can use crystal ware for serving ice cubes while having a night cap or a drink. Crystal wares also look beautiful when empty, so add them in your space as showpiece. Nevertheless they look splendid filled with fall leaves or flowers, too. A special event or day calls for a special crystal or glass ware giving your interiors the touch of luxury and pure art. Nonetheless, it adds an instant flair of exotic sophistication. To name a few of our crystal wares - Mario Cioni Sinfonia, Harrys, Perlage, Arabeque. Find our extensive collection here. Storage basket: These are a useful furnishing accessory for putting everyday objects in order. Choose these to give a touch of design to your home or maybe even gift your friend so to use it in their space. Spacious and robust, these storage baskets are flexible and can be used to organise magazines or books or to store any household object. They appear in different sizes, shapes and colours. Complement your decor with one of these and give that designer touch to your home furnishings. 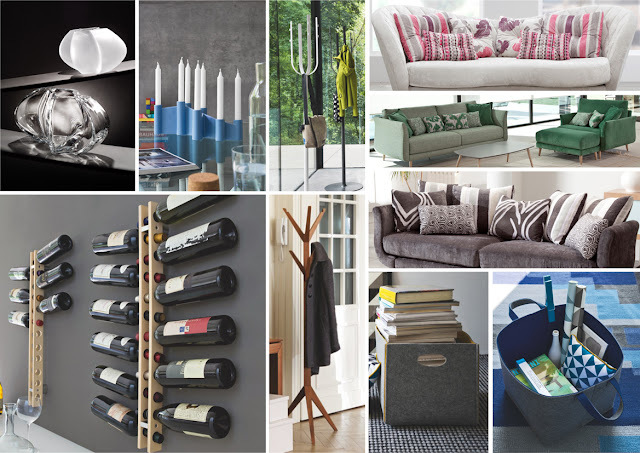 Our collection includes: Calligaris -Basket, Alwin, Elliot, Utility. Pillows: Pillows mainly serve to punch-up the elegance factor and provide your guests with a little extra comfort on your sofa, and offer a cosy, layered feeling to your space. If you choose pillows wisely, setting them up is a piece of cake. Throw pillows are usually small in size and are used to flaunt your space whereas the normal size pillows are used to rest on, and for comfort cosy feeling. Use contrast pillow colours to complement your decor. Pillows work not only to change the look and feeling of a room but also help balance the room by repeating the colours or patterns found on the other side of the room. Adding this accessory will help you achieve a plush elegant look along with touches of colour and patterns. Refresh the look of your space today with these and invite your friends for a fun time together. View Fama sofas for our extensive pillow collection. Bottle rack: Having friends around for a get together or to watch a movie? Bottle rack is one of the best options while serving drinks. With a modern design, this rack is a stylish way to put your glassware and lovely liquor bottles on display. And if you don’t have the space to go all-out with your home bar, placing it in your living space will make your guests feel welcomed to pick drinks whenever they wish to. Great looking and versatile piece, this rack helps you organize your bottles avoiding the chance of knocking over pricey glass liquor bottles. It saves valuable counter space, and will safely hold those special-occasion bottles for you. For instance our Calligaris Arsenal bottle rack. Candlestick: If you've got candlesticks in your closet or shoved in a cabinet, display them in your living space to add a note of elegance to the environment. A classic accessory you can display on your fireplace mantel, side table or centre table is a good idea. Though they all look similar, they vary in terms of height. Candles have been used throughout history to provide light, warmth and ambience in the home. They're often associated with romance and are a great way to create a mood of relaxation or calmness. Candles can be incorporated into your home in many forms, from collections of small candles to large pillars in their own decorative holders. Even if they're never lit, today's candlesticks are created to complement your home's décor simply based on their colour and design. Our collection include Calligaris Cathedral and Mario Cioni Candelalbero. Coat stand: They are not only known for their form but functionality too. Coat stand makes your décor look classic and as a piece of utility. You can use it as a coat holder or umbrella holder. Usually adorned at the corner of your home, for ease and accessibility. Our collection includes Bonaldo Tree, Tonin Casa Alga, Calligaris Flow, Landscape, Memorabilia, Medusa. Accessories are the most personal part of interior design. They give rooms personality and express you and your taste. These functional and decorative items tell something about the interests and activities of the people who live in the home. Accessories contribute to the overall cosiness of a space once they are layered together. Use them wisely and your interior will stand out and make your home livelier.